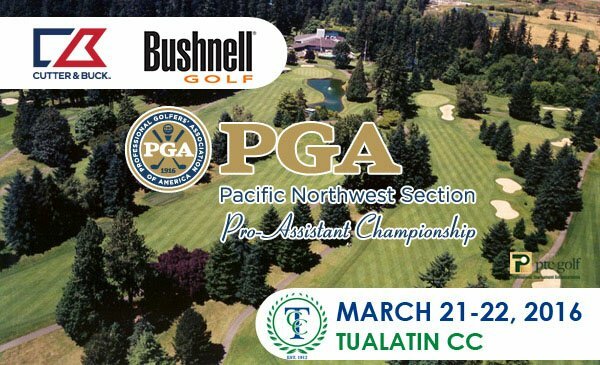 Entries are now available for the PNW PGA Pro-Assistant Championship at Tualatin CC on March 21-22. Head PGA Professional Sean Fredrickson is excited to host this year and invites you to join us for both the tournament and our Spring General Meeting, which will immediately follow our first round at 7:00 pm. You are all invited to attend. The meeting will be worth at least 2 MSR credits in required PGA Education, and it’s the only Section meeting where you can wear golf attire (although a jacket is also acceptable)! CLICK HERE to sign up online for the Pro-Assistant Championship. CLICK HERE to download the Pro-Assistant entry. What are you waiting for? Get your entry in and get the 2016 PNW PGA golf season started! Sally Schmitz is back as a presenting sponsor of the Pro-Assistant Championship with Bushnell. Bushnell has been the industry leader in high-performance sports optics for more than 65 years, constantly exploring emerging technologies to market sports optics that pair leading-edge design with performance innovation. Bryan Dickson is also a returning presenting sponsor with Cutter & Buck. Cutter & Buck was founded in 1989 in Seattle, Washington, creating premium sportswear and outerwear in styles with distinctive details and quality craftsmanship. We are happy to welcome back Matt Pollitt with PTE Golf for the third year as a supporting sponsor. The Pacific Northwest Pro-Assistant Championship launched into the tournament world in 1992 with a seven-hole sudden-death match between the Progress Downs team of Jerry Minor/Ralph West and the Royal Oaks team of Steve Bowen/Michael Wilkerson with the Progress Downs’ team being victorious. It was been a fun and exciting event ever since. Since its inception in 1912, Tualatin CC has established a reputation as one of the finest country clubs in Oregon. The course is a Chandler Egan Design, defined by large Douglas fir trees, tight fairways and small greens. Tualatin CC has had the great opportunity to host some of the Pacific Northwest largest championships since its inception. Among those are: the PNW Assistant Championship in 2007, 2011, and 2015; the Hudson Cup in 2014 and 2015; the PNW Senior PGA in 2008; the Northwest Open in 1986; and the Oregon Open in 1946, 1950, 1954, and 1962.